The pink cashmere cable knit deer may be my favorite. Created by Rachel Denny as an art piece, I just love the color and the beauty it brings out. The animal heads on the bottom right were found by the fabulous Novogratz duo. I wish I knew where I could find them myself?? I'm drawn to that warthog, my new favorite animal. Grouping any one thing together is always a great design trick and it works well for these five animal heads. I love the myriad of textures and complementary colors. Ceramic animals are on the pricey side but still quite fun. Find them here. A beautiful bedroom... I like the mix of vintage science posters, the soft fabrics and industrial shelving with this animal head. 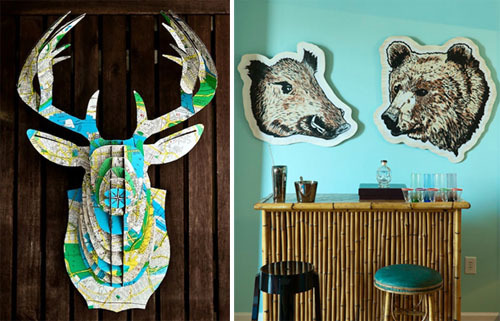 I found two great Southern designers that have their own take on animal head decor. The first is Jen Khoshbin of Ruby's Lounge in San Antonio, Texas. She makes these lovely deer heads to order and I love how unique and fun these are. They are covered in various patterned papers that are as colorful as they are beautiful. 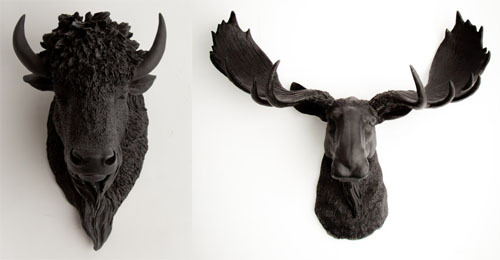 The Tex Longhorn would be perfect for any Texan's home. I remember when I did a shoot with Flavor Flav for VH1 and he put fresh croissants on the ends of his viking horns. For some reason, that's what I think about when I see this. 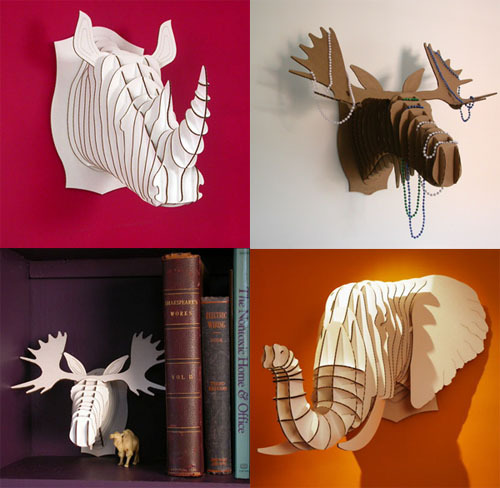 See more of the fabulous Cardboard Safari shop here.